New FE 24-70mm F2.8 GM (model SEL2470GM) Standard Zoom Lens comes with some of the most innovative and advanced lens technologies that are available. It ensures to become an ultimate choice for those who seek the best possible optical performance for portrait, event, and travel photography. The same goes well for every day shooting for professionals and enthusiasts. The new lens is designed with three aspherical components including a newly developed & extremely accurate XA (extreme aspherical) component that helps in reducing aberration and thus ensures the ultimate resolution throughout the complete zoom range and aperture range, as well as from corner to corner of all images. In addition to this, an ED (Extra-low-Dispersion) glass element and Super ED glass element keep chromatic aberration to the least value while maximizing resolution and bokeh without compromising with coloration or natural quality. The new FE 24-70mm F2.8 GM lens comes with a direct drive SSM (Super Sonic Wave Motor) focusing mechanism that functions with amazing performance because of its new set of algorithms that set the lens element faster and with high precision. The motor functions quite smooth and noiselessly thus giving it a full advantage of becoming the first choice for shooting both still images and movies. 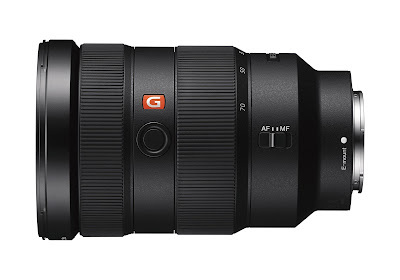 The usability of new FE 24-70mm F2.8 GM lens can be maximized or enhanced as the lens is moisture and dust resistant and is with a compact, sturdy and flawless design that includes AF/MF switch as well as zoom lock, focus hold, and hood release buttons. Two new matching filters for this amazing lens have also been launched including the VF-82MP MC protector and VF-82CPAM Circular PL filter. The lens has a 9-bladed aperture to maintain a nearly circular shape at all settings. It comes with Sony's original Nano AR coating to help in the suppression of reflections and thus ensuring fabulous contrast and clarity in images produced.